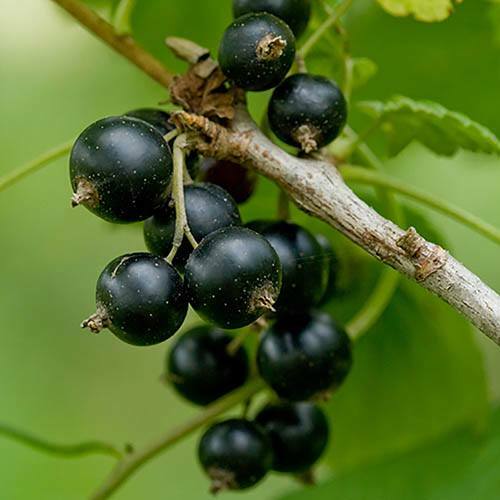 Bursting with flavour and Vitamin C, the large glossy black fruit of Ben Lomond cover the branches of this completely new type of blackcurrant in mid-summer. This compact beauty only ever grows to 3ft (1m) making it perfect for the smallest of gardens grow it in a border, a large pot or even plant several to make a fruiting hedge. Really easy to grow, Ben Lomond will thrive in a sunny, sheltered spot out of strong winds and prefers well-drained soil (or compost). Plants are as tough as old boots and have flowers that are resistant to frost. Supplied in a 3L pot ready to plant out. Bursting with flavour and Vitamin C, the large glossy black fruit of Ben Lomond cover the branches of this completely new type of blackcurrant in mid-summer. Unlike most others, which require a lot of space to grow, this compact beauty only ever grows to 3ft (1m) making it perfect for the smallest of gardens grow it in a border, a large pot or even plant several to make a fruiting hedge. Really easy to grow, Ben Lomond will thrive in a sunny, sheltered spot out of strong winds and prefers well-drained soil (or compost). Plants are as tough as old boots and have flowers that are resistant to frost. All you need to do to ensure a bumper crop is feed them well with blood, fish and bone in mid-spring, followed by a dose of poultry manure or another high nitrogen plant food, in June.